Study any social problem and at its ultimate core you'll only find one root cause. If you want I'll hand number it (with silk screen ink on inside of collar) but you'll have to email me if you can't specify a note in Etsy. No one has number 1 yet as of December 28, 2015. 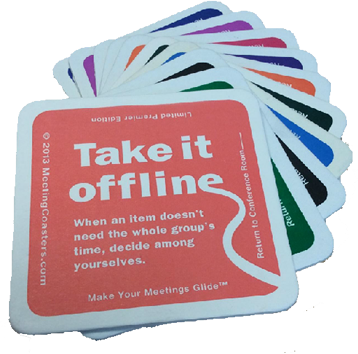 MeetingCoasters are available on Amazon.com is a cheap, super-simple solution to all things that drive you nuts in office meetings. In a meeting with ten people if it saves even 5 minutes, it will pay for itself in one meeting. "Baby Steps to iPhone Programming," a free, forum-based, asynchronous training course that steps you through the basics of developing apps for the iPhone and iPad. An iPhone app for chefs and wannabe-s to come up with those fancy-sounding dish combinations that wow us in great restaurants. Yes, your dog can talk. Put this iPad app in front of that budding genius and you'll be hearing his or her innermost thoughts before you know it... as long as those innermost thoughts are one of four things: food, the car, playing, or taking a walk. In the iTunes App store now. A simple correction that will prevent injuries like the recent one to a Montreal Canadians player. "Dollar-Store Disposable CEO" is my favorite so far from the terms that this handy little iPhone app has come up with. Now in the iTunes store for your iPhone but also available as a web page version. In standard desktop browsers it has varying levels of semi-functionality, best in Safari. Commentary and many free resources for software usability, based on my non-stop focus on user advocacy... "learnability gallery," RFP criteria, function tree, free heuristic reviews, and more. Simple solution to the problem of iPhone home pages with too many apps. Trying to find something good to do with a sculpture I made recently, I propose "The Ridley Award" to honor Harrison Ridley, Jr. a beloved radio host of a long-time show enlightening the public to the beauty and pleasure of jazz. The site is a Ning.com social networking site to cultivate support. infamous carpal tunnel syndrome—and substantial content from our Amazon 5-Star book on on the subject, in its 10th printing. OfficeSwap is an experiment... a free database that lets you try to swap jobs with someone who works close to where you live and lives close to where you work. No, I'm not kidding. Pure social networking... no fees or conditions... uses Zoho.com for technology and login accounts. This site is usable but no one has posted a real commute yet. 2011 update: first ever casting is ready for sale. If you think global warming is a biggie, wait 'til our kids have to deal with this one. 36" round, bas-relief sculpture of Man's Greatest Story of Survival and Rescue. A little bit of a debacle, quite a bit of an obsession, but a massive work of art nonetheless. Free Macromedia Director Hockey Shootout Game, 700K Zip Download of an EXE... A genuine web antique! A Macromedia Director piece originally produced for Shockwave, the predecessor to Flash. The Ultimate Gift! A likeness of you or your favorite person (you? ), 1" tall. With or without a loop to hang on a chain. Put this on the board at the next Monopoly game and people will surrender. My 15 column-inches of fame. Free booklet on software usability. A software antique. A program written for the Atari 800 (in Basic) and later, Commodore 64 (in 6502 Assembler). Run it free in an emulator.